Buddh International Circuit is India’s only formula 1 ready race track. But somehow not too many races are happening in India at present and BIC, and is mostly used for various corporate events- mostly media review of upcoming vehicles. 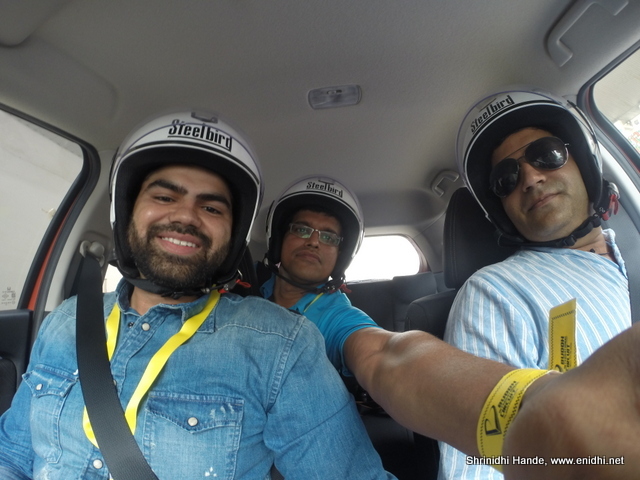 I had the unique opportunity to visit BIC and drive on the F1 racing track, thanks to Honda Cars India Pvt Ltd. For their event- Hangout with Honda, I was privileged to be part of, along with about a 100 other bloggers and influencers from Delhi NCR region as well as rest of India. I will write about the car separately, in this post, I will share some photos of the circuit and few of by observations and details. The Buddh International Circuit is 5.1 kms long, longest stretch of straight track is 1.2 kms. There are about 8 turns of various sharpness to test driver’s skills and abilities. Track also has altitude variations. Folks at BIC take their driving very seriously. We signed indemnity bond on real stamp paper, not a paper printout as we used to do in other event. Helmet is also mandatory for everyone sitting in the car. BIC is themed with India Tricolour, so you will see orange, white and green everywhere. Entire track is monitored from the control room with the help of over 50 cameras, which can pan, tilt, zoom in, zoom out. “We can even read text on your shirt’s button”- we were told. (I am not sure how camera zoom can hold steady focused on the T- shirt of a person sitting inside a car moving at 100kmph for someone to read the text, but let us accept that they have very powerful and capable cameras to help monitor the track and cars and advise corrective actions or initiate rescue should anything go wrong). Every point on the track are monitored by at least 3 cameras, so 3 different perspectives are available for better visibility. Instructor is always correct and to be obeyed all the time. If some other car meets with accident we shouldn’t stop and try to help. Trained rescue team can reach any part of the track in less than 3 minutes. We should keep going unless instructed to stop. If the car in which we’re sitting faces an accident or problem, we should remain seated in the car. Rescue team will come and take us out. Only exception is visible fire. If there’s visible fire then occupants should get out of the car, while exercising caution that there’re no other cars coming from behind while opening the door. While the track is wide, there’s a particular line which if followed saves several hundred meters overall- this is kind of central line which saves a bit of distance in turns. All racing drivers fight for this line and try to optimize their line and length so that few meters saved can make a difference in their pole positions. Obviously no photography or selfies while driving. Helmet almost touches the roof of Jazz, so fixing goPro on a helmet is tricky, unless we can mount it on the side. Because we were there for an experience, not race, we were to drive in a convoy, led by a pilot car and tailed by a sweep car. First lap we went little slow (40-60) and next lap we went little faster (around 100kmph in straight lines). After my drive I went for second round sitting behind as a passenger. One instructor sat in each car, equipped with a walkie talkie, through which one way instructions were issued. No acknowledgement was expected, just obey the order. BIC has dedicated space for every team and other activities related to the race. There’re different levels of stands, depending on how much you can afford to pay for the tickets. During international events, it attracts so much crowd that all hotels in and around Delhi get sold out. Naturally they had their safety concerns which meant I couldn’t drive at will and test my racing skills. But still it was a memorable experience to drive on a formula one track at formula 100 speed. Wow a great experience for sure!! If yes, must be luxurious drive.